The trip starts with a guided drive to the dive site where you drive by the beautiful scenic homes and shops and authentic Mexican countryside, you will receive the first-hand knowledge of the local sights and historic sights of Ensenada. It is about a 40 minute drive, including some breathtaking views on the dirt road mountain pass up, over and down to a gorgeous secluded cove, where you will put on all of your gear and start your introduction to your Snuba experience, a cross between Scuba Diving and Snorkeling no prior Diving or Swimming experience and no certification required, Minimum age is 10 years old. Snuba is the way to go if you have never dove. The very same thing as a real Scuba diving, only designed for the first timer wanting to experience the magic and mystery of the underwater world, even an experienced diver will be blown away by the ease and freedom of movement. A very practical, up close and personal introduction to diving and the underwater world. Not only an adventure but a true conquest. We start out by teaching you to snorkel, when comfortable enough, we slowly take you down to about 5 feet and work our way down deeper depending on your comfort level. 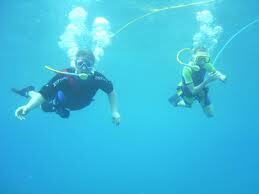 This is real diving, not just play, you will wear all the gear, wetsuit, hood, mask, fins, booties, gloves, weight belt. Minimum age is 10 years old Remember to bring your camera. Bring or wear a swim suit & towel, and also sunscreen. IMPORTANT: Please be advised that if you have a history with any of the following problems: heart, lung, epilepsy or seizures, decompression sickness, ear or if you are more than 3 months pregnant you will need to request the waiver prior to your trip for a physician approval.